Managing multi-channel communications within a single corporate marketing function is challenging enough. But if your organization has a corporate marketing entity that also supports local or regionally distributed marketers, you know it’s exponentially harder to manage brand consistency and the customer experience in this environment. 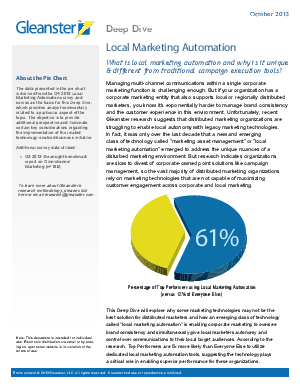 This Deep Dive from Gleanster Research will explore why some marketing technologies may not be the best solution for distributed marketers and how an emerging class of technology called “local marketing automation” is enabling corporate marketing to oversee brand consistency and simultaneously give local marketers autonomy and control over communications to their local target audiences.